I started to build a photo studio in my basement and this is one of the first pieces of equipment I came up with. As I try to do this on a very small budget a lot of stands, props and what not will be home made. This particular stand came in free for me as I already had all the materials lying around in the garage from previous home renovating projects. Even if you were to buy everything it would still cost under 20$. What I used is a plastic bucket (leftover from the driveway sealant I used last summer) which I filled with some ruble and mortar. In the middle I fitted a 1.5" coper pipe, about 40 cm in length. . This is what I had on hand and I didn't bother to shorten it. I cut a 2" hole in the center of the bucket cover and I use it to improve the looks a bit. This is the business end of the stand. 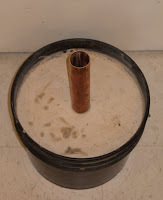 I used a length of PVC pipe with one end freestanding inside the copper pipe. 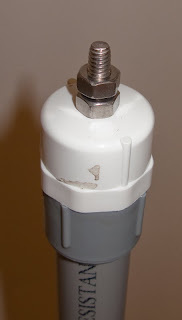 The other end of the PVC pipe is fitted with an endcap through which I passed a 14-20 screw. 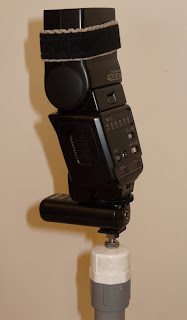 I can attach the flash using the stand which Canon was kind enough to supply with the flash or a RF602 receiver. As everything is press fitted, I can easily take it apart and use different lengths of pipe. Next, I will fit an adjustable horizontal arm. I'll keep you posted. I have to give credit this guy for inspiring the project.